In march 2009 Rick and Peter started recording the first demos of this debut album in Droomtent Recording Studio. It was a marvelous time and soon we realized that we were working on something special. We were fortunate to have had a unique combination of great lyrics and strong melody lines from Rebecca and Helmoet. In addition, Rick had the ability to arrange beautifull backing vocals and beautifull instrumental arrangements. We had so many laughs together while working on this project that we will never forget. Many of these moments are recorded on video or photographed. A part of the footage can be found on this website along with a collection of some of the photos. It provides a permanent memory of such a wonderfull time. It’s heartbreaking that our friend Rick Duijn has passed away in 2011. We dedicated this album to Rick. We would like to thank all the talented musicians and technicians who have worked with us to accomplish this album. Magnificent!! You can buy this album on CD and vinyl in our webshop. Our album is also available on iTunes. Below you can listen to a preview of all tracks! 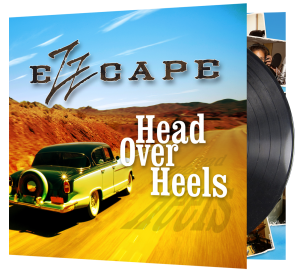 All songs from Ezzcape are recorded at Droomtent Recording Studio in IJmuiden and produced by Peter Wezenbeek. The arrangements are created by Rick Duijn and Peter Wezenbeek. The musical history of Rick and Peter as drummers in several bands has given the necessary musical baggage which have come to golden and platinum records which can be found on the walls in the studio. Rick has played in many local bands but also with Marco Borsato, Paul van Loon and Birgit Schuurman. Peter was also a drummer in a reggae band, has played with The Wailers in Tivoli Utrecht and scored a European hit with Comment ça va with The Shorts in 1983.